Pour sugar in glass and add mint, pound with a flat instrument to crush or “muddle” the mint into the sugar thus releasing the oils. Add ice, rum, and lime juice, fill with soda water, and stir. A special thanks to Richter’s and Catherine for sharing this recipe. Ernest Hemingway made this refreshing Cuban cocktail famous in southern Florida. Mojito mint lends a traditional mild, warm flavor that is not pungent nor overly sweet like other mints. We’ve heard that Havana Club three-year is the Cuban rum of choice for this drink, but Bacardi Superior Light, Captain Morgan’s Silver Edition or Oronoco are all good substitutes. 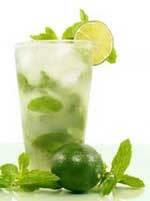 Some mojito aficianados suggest using simple syrup or the more traditional sugar cane juice, called guarapo. This recipe, from A Taste of Cuba by Beatriz Llamas and Ximena Maier (New York: Interlink Books, 2005), starts with a mojito base. Then you prepare the mojito itself adding sparkling water and ice to the base so it’s a wonderful time-saver for parties. Beat the sugar, lime juice and mojito mint with the stems until you get a greenish liquid and the mint is completely chopped. Add the rum and beat for one more minute. This can be kept in the fridge for a month. To prepare the mojito, fill a tall glass 1/4 full with the base liquid, add 3 ice cubes and then fill the glass with sparkling water. Add a sprig of mint, stir and serve. glass with more ice, add club soda, and garnish with mint. Try adding one part creme de menthe for a refreshing mint margarita. Pour tequila and orange juice in a highball glass. Add ice and stir. Shake with ice. Strain into chilled sour glass. Garnish with lemon slice and maraschino cherry. Stir with ice. Strain into chilled cocktail glass. Garnish with an olive. Tequila is made from the roasted heart, or piña, of the blue agave or maguey plant (agave tequilana weber azul). Agave takes 8-12 years to mature so you may wish purchase some premium tequila for cocktails while you tend your agave plant. For more information about tequila, pulque, and blue agave, visit Ian Chadwick’s site: In Search of the Blue Agave. According to the Washington Post, "… bartenders who once mashed — or in bar-speak, muddled — only mint for mojitos and juleps are bringing the rest of the herb roster into play. Herbs are key ingredients in dozens of late summer cocktails. Cilantro, rosemary and thyme are common. Every sort of herbal garnish goes. And with home gardens and farmers markets at a seasonal peak, plenty of fresh herbs are available." In a medium saucepan, add the 2 cups of water and 1 cup of sugar. Bring to a boil, and stir to dissolve the sugar. Squeeze the juice from the lemons into the mixture, and add the lemon pieces. Add thyme and stir. Boil until the liquid is reduced by half. Cover and refrigerate for 1 hour, then strain. This will make enough lemon thyme mixture for 8 drinks. When ready to serve, chill a martini glass. Fill a shaker with ice. Add the tequila and 2 ounces of the lemon thyme mixture and shake vigorously. Strain into chilled martini glass, top with a splash of the lemon-lime soda. Garnish with the sprig of thyme. In a large pot, add wine, water, sugar, honey and the lemon and lime zest and juice and bring to a boil. Remove from heat. Add verbena leaves and steep at least 12 hours. This makes enough verbena syrup for 25 drinks. For 1 verbena martini, mix 1 ounce of the verbena syrup with the citrus rum or citrus vodka. Shake and strain into martini glass. Use extra verbena leaves for garnish. In a large saucepan over high heat, add the simple syrup and coconut water and bring to a boil. Add the purple basil and boil for 2 minutes. Add the lime juice and stir. Remove from heat and pour mixture into blender. Blend on high for 2 minutes. Strain twice through a fine mesh sieve. Refrigerate for 1 hour. Makes enough basil cocktail mixture for 10 drinks.When ready to serve, chill a martini glass. Fill shaker with ice, add the rums and 2 ounces of the basil cocktail mixture and shake vigorously. Strain the rum and basil mixture into glass. Garnish with a basil leaf.